I like James Wan. I like Leigh Whannell. I like them both when they work together, even though the duo is responsible for the execrable Saw franchise. But after seeing what they are capable of in the ghost subgenre of horror, I can write that it is good for horror when they collaborate. 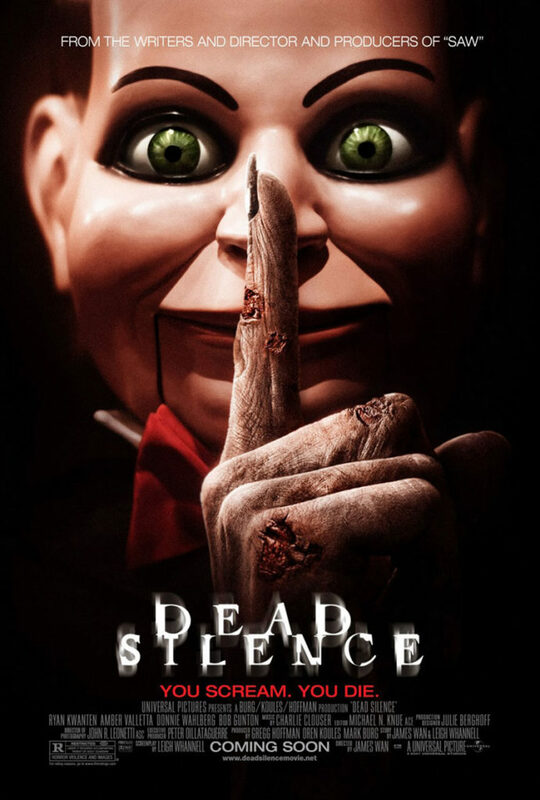 Before Insidious, there was Dead Silence, Wan and Whannell’s first foray into the supernatural. From 2007, Dead Silence stars Ryan Kwanten as Jamie Ashen, a young professional in the city with a nice apartment and a pretty wife (Laura Regan). One evening a mysterious package arrives at the apartment. Inside is a creepy ventriloquist doll (but those dolls are all creepy, right?). While Jamie is away to pick up some takeout, it is revealed that the doll is some sort of vector for the supernatural. The doll doesn’t come to life, like Chucky in Child’s Play or the clown doll in Poltergeist, but it does display some twitchy behavior. The doll is more haunted than possessed. Either way, before Jamie can return to the apartment, his wife is brutally murdered by whatever inhabits the doll, and the plot is rolling. After some twists and turns, we learn that Jamie hails from the town of Raven’s Fair. Once upon a time, Raven’s Fair was a bustling little industrial hub, but it has fallen into a depression worse than anything to ever hit the Rust Belt. It turns out that the spirit haunting the doll may be responsible for this, and much more. The remainder of the film follows Jamie as he investigates the twin mysteries of Raven’s Fair and the doll, hoping to find some resolution before he becomes another victim. Whannell has often been a screenwriter whose ideas exist just beyond his abilities as a writer. For example, with Insidious, he claimed that he purposefully avoided ghost film clichés while writing it, yet that film follows many of the same plot points established in Poltergeist and imitated in many other films. With Insidious: Chapter 2, he showed that he can weave complex narratives out of seemingly throwaway moments that span multiple films — no easy feat. Dead Silence exists in a sort of halfway point between cliché and complexity, but what it really resembles is fun house trickery. If carnival companies made movies, this is the type of movie they would make. Wan’s direction has maintained the same sense of style throughout his career in horror. It’s a style where no detail is left unaddressed. The sets are always meticulous and do as much work as the screenplay in establishing the mood of his films. His sets are almost too much, having the weird effect of looking too perfect to be real. Like other Wan/Whannell collaborations, the exacting detail and plot acrobatics are mere sleight of hand, misdirection, distracting viewers from noticing that there really isn’t much depth to the film after all. Add in a quick cut editing style reminiscent of mid-1990s music videos and the entire enterprise can feel overcooked. The strangest thing about a Wan/Whannell joint is that they can feel like an enigma. Mystery has always been a part of their oeuvre, but I’m referring to something different. Dead Silence looks like a horror film. It’s creepy, and it’s got scares. There’s a bit of gore, and an escalating body count. But it’s a horror film in the same way your neighbor is really a lizard person. Sure, Bob seems like a nice guy, but you just know that as soon as the shades are drawn, he peels off his face and eats live hamsters for dinner. Watch your back around Wan and Whannell. I think they may have been sent here to study us before the invasion.